A southbound Amtrak train derailed in central Vermont on Monday morning. The train apparently struck rocks that fell from a ledge onto the track near the town of Roxbury at around 10:30 a.m. ET. 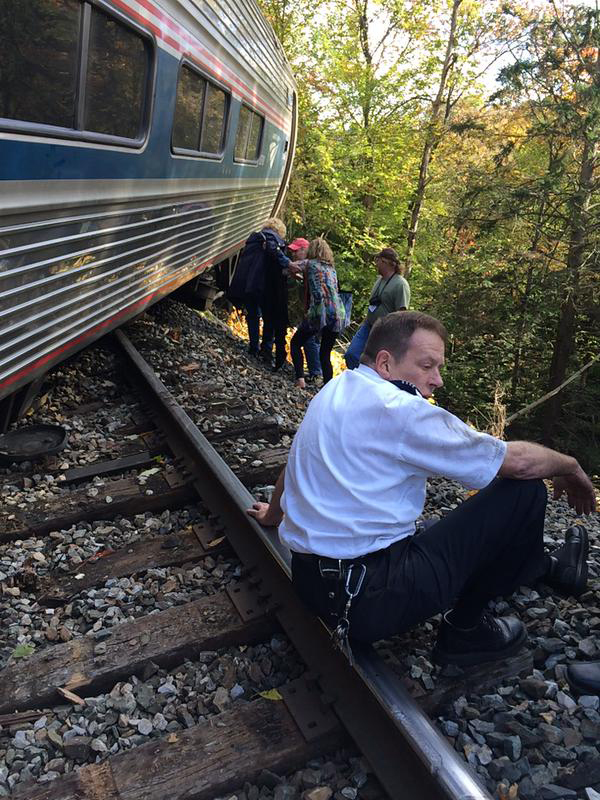 Five cars derailed, two of which went over an embankment, the Montpelier Fire Department told NBC News. "This was a freak of nature," Vermont Gov. Peter Shumlin said in a news conference Monday afternoon. One injured person was flown for treatment in New Hampshire, while six others went to the emergency room of the Central Vermont Medical Center with injuries that were not life-threatening, The Associated Press reported. At least several dozen passengers were taken away from the accident on school buses. Emergency personnel and investigators from the Federal Railroad Administration were traveling to the scene. The train is part of Amtrak's "Vermonter" service, which runs between Washington, D.C., and St. Albans, Vermont. In 2014, the line served about 88,000 passengers. An Amtrak train derailed in Vermont. Four people were injured when two cars went over an embankment, according to the Montpelier Fire Department. Passenger Rodger Bell told NBC that he and his wife "felt something hitting the train" before the engineer applied the brakes. They were "tossed around a bit" but were not hurt. The derailment comes after a tumultuous period for Amtrak, when it dealt with the aftermath of an accident near Philadelphia that killed eight people. The incident, caused by the train speeding around a turn, led to a national conversation on the state of U.S. infrastructure and the presence of safeguards on railways.